There is no refund for booking cancellations within 5 weeks after booking. 50 % will be asked as down payment of the booked accommodation. requests should be made at least 1 month ahead. Zion Country is a water front property with private (Pebbles) beach. It is set in a beautiful lush garden. 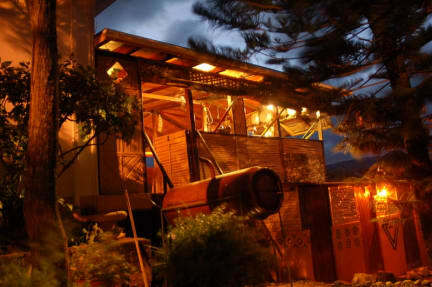 It is set up with rustic beach cabins with hammocks and get regular visit from Manatees. (Sea cows). This is the place where you want to be, far away from any commercial tourism with a friendly staff what goes the extra mile for you and in a very natural environment. It offers a private beach with nice swimming waters and sometimes visit from dolphins & manatees. Breakfast included and Free Wi-Fi. It is a cozy popular place by: nature freaks, back packers, low budget guest, bird watchers etc. Zion Country beach cabins is situated on the edge of the peaceful community Long Road and it bounder the harbor of Manchioneal were the river from the beautiful water falls: Reach Falls mound out in front of our property. It's also close to all the beaches between Zion Country and Port Antonio. we are also close to hot springs and a spectacular water dam build by the English. 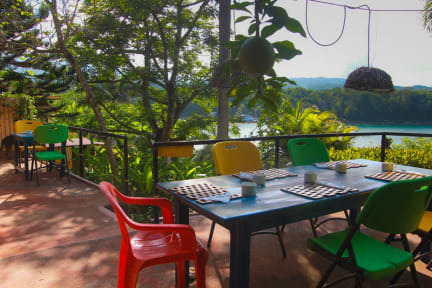 Each unit has two rooms (2 persons each room), there is atmospheric light in the cabins, a sea view and balcony where you can relax or fall asleep in a hammock. Or you can walk outside the gate into a friendly Jamaican Community. Cancellation policy: 3 weeks before arrival. We are available between the hours of 8.30 am till 10.00 pm.